Pink Ribbon Facebook Photo contest! Thursday, October 20th, 2011 | Author: Bunco Betty! Spread the word about Breast Cancer Awareness! 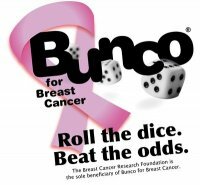 Share how you hosted a Pink Ribbon Bunco Party and upload a photo of you and your bunco ba bes to the Bunco Game Shop Facebook page. This will automatically enter you to win the Pink Ribbon Party Pack! We will select one winner on Oct. 24th and Oct. 31st so hurry and enter now! Take a photo from your pink ribbon bunco party. Upload your photo to the Bunco Game Shop Facebook Page. On October 24 and October 31st we will select, at random, one winner from the Facebook photo posts. Winners will be contacted via Facebook. 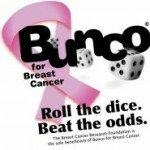 Each winner will receive a Bunco Pink Ribbon Party Pack! Good Luck! « Our favorite dice game!